As a homemaker/mother (who never used the term, “stay-at-home mom”) widowed at a young age, she took a big gamble to purchase the first T*C*B*Y frozen yogurt franchise east of the Mississippi River In the mid-1980’s. she’d gone to a T*C*B*Y store in Arkansas and knew instantly it would be a big hit back home. When she returned to North Carolina, she decided to mortgage not only her own home, but also the 4-room house and land she’d inherited to buy the local franchise. In 1984, she opened her first yogurt store. In the years that followed, two more stores joined the first one before she finally sold the franchise. This wasn't the first time or the last that my mother “bet big.” She always had a knack, an instinct, for predicting upcoming styles and trends years before they reached central North Carolina. And, she acted to create whatever she envisioned. As teenagers, my sisters and I were always embarrassed to be so far ahead of the styles because she would make us wear any of the clothes she'd made. In response to our bemoaning, she'd say, "It'll be in style, just mark my words!" Without a doubt, by the time the styles finally reach popular status, she had already moved on to the next up-and-coming trend. The same was true for land speculation. She convinced my father to buy property and build a house in what was only a forest and red mud roads on the outskirts of town. The area eventually became a thriving neighborhood and a leading edge of growth during the era of suburban flight. Later on in her life, she literally followed her own advice, taking regular junkets to the casinos in Atlantic Beach, NJ. She won so big that some of the casinos had to send her 1099 tax forms several years in a row. I’m not saying that any of us have to bet the family farm or put our paychecks on the line at the blackjack table. But, I wonder where “you gotta bet big to win big,” fits in your life? Where are the places you might be playing it safe rather than following your hunches? What does your heart know to be true that your head keeps ignoring? Or, more likely, what does your monkey mind continue to explain away until you have a mile-long list of reasons as to why your heart is wrong? You already know what I’m talking about. Your heart is nodding in agreement. And, you’re already clutching your head in anticipation of more arguments. So, what’s holding you back? Really. Tear up the list and throw caution to the wind! See which way all that confetti of caution blows and follow it. Follow your heart’s yearning, your own instincts, even if it’s one tiny step at a time. Let it lead the way for a while and give your monkey mind the job of figuring out exactly how to make it happen. By taking even baby steps toward the wishes of your heart, you are demonstrating your trust and faith that they can indeed happen. When will you begin by trusting your knack for what your heart already knows? 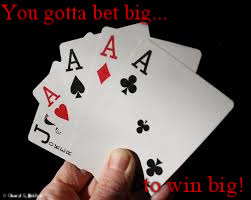 What can you “bet big in order to win big”? Newer Post30 Days of Poetry?! ?